Archaeologists in Kazakhstan have recently uncovered a pyramid-shaped mausoleum that’s over 3,000-years-old, making it older than some – but not all – of Egypt’s pyramids. 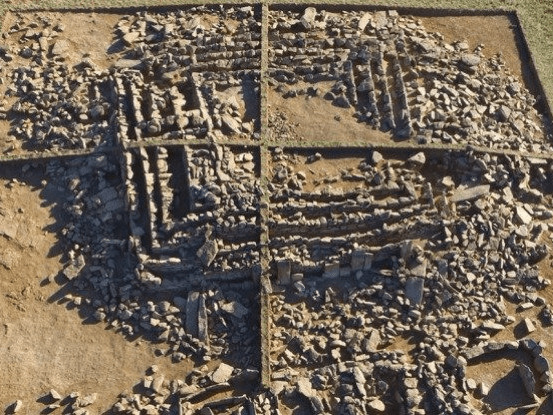 The remarkable discovery was made in the Sary-Arka region near the city of Karaganda, and the team says it was likely built for an ancient king or clan leader. The team – led by Igor Kukushkin from Karaganda State University – is still in the process of excavating the site, but so far it seems to have been built for a similar purpose as the Egyptian pyramids, with the archaeologists coming across a mausoleum inside the structure. They say that the mausoleum is about 2 metres (6.6 feet) tall and 15 by 14 metres (49 by 46 feet) long, making it quite small for a pyramid. “It’s made from stone, earth and fortified by slabs in the outer side,” Novozhenov told Owen Jarus from Live Science. The structure of the pyramid is unique as well. Instead of coming to a point like the Great Pyramid of Giza, the newly found structure consists of six stepped layers with a flat top, making it more like a stepped rectangle rather than a true pyramid shape. Inside, the team found that the pyramid’s burial chamber was likely robbed long ago, leaving only pottery, a knife, and a few bronze objects. There’s no word as yet on whether or not there were human remains buried there. Going on early evidence, the structure was likely built more than 3,000 years ago, around the time of the late Bronze Age. But it’s not – despite what some outlets have claimed – the oldest pyramid ever found. In fact, the Pyramid of Djoser in Sakkara, Egypt, was built about 1,000 years earlier, between 2667 and 2648 BC. The Great Pyramid of Giza was built around 100 years later, making it older than this new Kazakhstan pyramid – although it will take more time for the team to accurately come up with a date of construction. Even so, the find is exciting because it will likely shine new light on the Begazy-Dandybai culture that lived in central Kazakhstan. Researchers already know that mausoleums like the one recently found were reserved for those of high social status – likely kings or clan leaders – but other than that the society remains mysterious. The team is still excavating the site, so their work has yet to be published in a peer-reviewed journal, and it will likely be a while before we can delve into their full findings. But it’s nice to know that there’s a new mystery to explore in the world. Read the original article on Science Alert. Copyright 2016. Follow Science Alert on Twitter. Next Next post: How Big is Mercury?